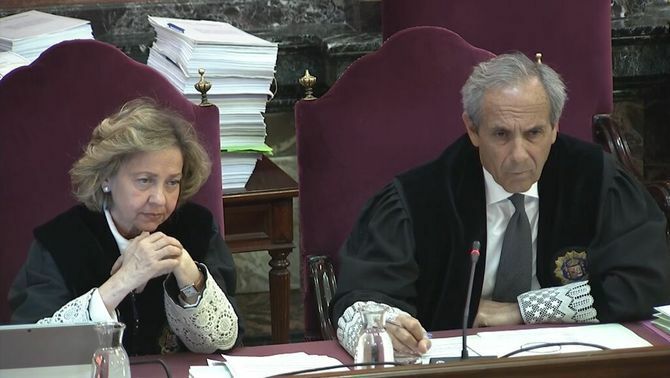 Corporal TIP H77877T described the results of the search of Josep Lluís Salvadó's office as "spectacular"
The Catalan independence trial has reached its twentieth sitting on Thursday, when 10 Guardia Civil officers are expected to take the witness stand. 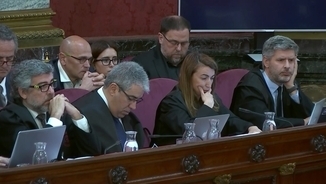 In particular, the officers summoned with regard to the notes in Josep Maria Jové's agenda, the searches in the Economy building and in publicity companies stand out. 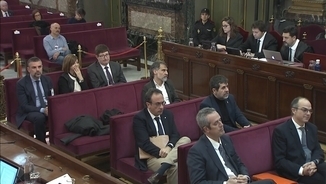 The first officer to take the stand was the Guardia Civil corporal identified with TIP number H77877T, who participated in the search of the office of erstwhile director-general of Asset Management, Francesc Sutrias, in the Ministry of the Economy. 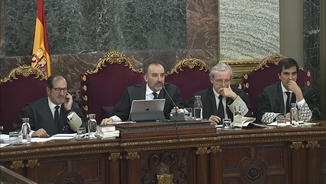 When questioned by prosecutor Jaime Moreno, the corporal stated that he was also in charge of analysing the documents found in the office of former secretary of Finance Josep Lluís Salvadó. "The search of mister Salvadó was spectacular with regard to documents: customs, a property registry, and a tax administration were basic because, if I may say so, they were very concerned with funding, namely, how they would survive financially after declaring independence after independence took place or not. There were a great many documents." 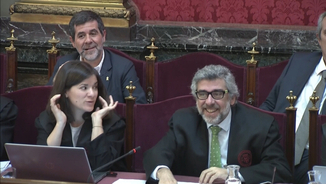 He also explained that his report focused on the analysis of the financial plans he says existed between a hypothetical declaration of independence and the beginning of the activity of an independent Catalan tax administration. According to officer H77877T, they found bills for trips abroad by Salvadó and the former secretary of the Economy and current vice-president and minister of the Economy, Pere Aragonès, in Salvadó's office. According the officer, the latter was in charge of seeking "international funding". "Among mister Salvadó's documents, apart from trips abroad for funding, an email message with no sender was found in a pen drive. Only the text had been copied, and it was an email message that discussed that they had requested funding from China. They requested 11,000 million Euros from China." 5 months ago, TV3 already had access to a Guardia Civil report that accused Pere Aragonès of having held "meetings with a contact in the Chinese government" to request these funds. According to that report, apart from seeking foreign funding, Aragonès was also considering the creation of a national bank of Catalonia. 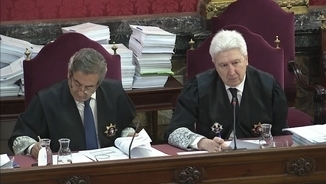 Between the declaration of independence and "own administrative structures"
Other documents accounted for  4,500 million in "public sector" income with a computer programme ordered from the IBM Company. According to one bill, this programme had cost 240,000 Euros, and the corporal believes they had been paid for. "This is the money they required to support the declaration of independence until they had their own administrative structures that would allow them to collect taxes normally, like a state." "It was a roadmap that read "independence of Slovenia", and it was a comparison, though not an exact one: the Slovene police did not face the Yugoslav army when independence was declared, and there was a sentence that read: "Nevertheless, Yugoslavia was a collapsing federation and Spain is not: it is a stronger country". Beyond that, I did not see anything saying "the Mossos will take care of that."